The wine rack unit for those of us that like a tipple or two. This great wine rack unit with two large storage cupboards, basket shelving and loads of space for wine. 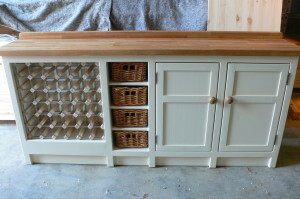 This wine rack unit has been painted in our old favourite ‘ringwold ground (F&B), it has an oak worktop which has been treated with coats of waterproof wax making it durable and matching wooden knobs.